The atmosphere was truly electric!! 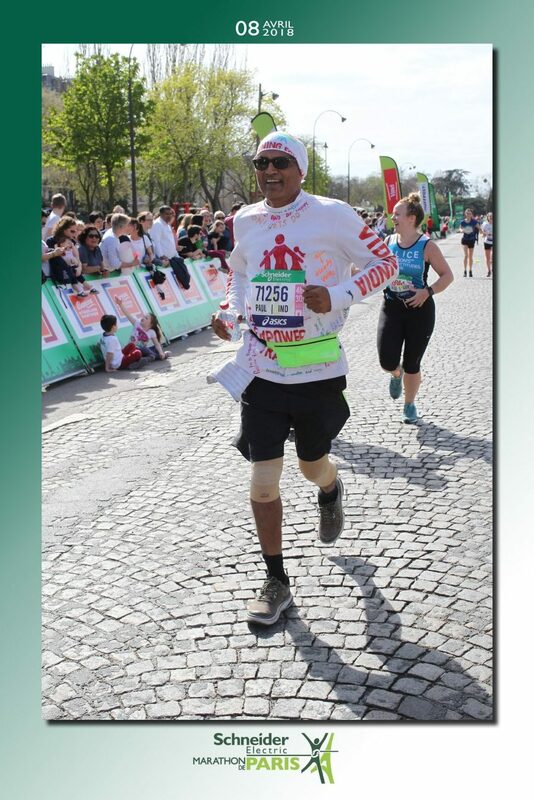 55,000 people from various countries, various age groups with varied level of fitness, targets and motivation stood on the ‘Champs-Elysees’, one of the prominent streets of Paris, on a warmish Sunday morning to take on the treacherous 42.2 km route of the Schneider Electric Marathon, 2018. I was out there, clad in the “VIDYA” attire, with a graffiti of interesting messages from the VIDYA students all over my attire . I was running for VIDYA and the thought of running for this cause was filling me up with so much energy to roar forward. The run started at around 10am Paris time and we ran through the most picturesque sights of Paris with crowd cheering on both side of the roads, with local bands playing, kids dancing, through the water showers to keep the runners cool, stopping by the water/snack stations . The weather was uncharacteristically hot with a blazing sharp sun on our head and that made the run more challenging. I could hear each one my students say ‘Go Sir Go’ as I was trudging the last 11 km after hitting the wall at 31 km. The run time stats are not impressive enough to write home about , but the important thing is that I finished the run and I finished strong. We ran a fund collection campaign around this event. I reached out to all my friends, shared my intention to run for VIDYA and requested them to join the run by contributing funds for our school. The response was absolutely fabulous both in terms of encouragement and fund contributions. I am pleased to share that we exceeded our collection target of INR 15 lakhs with generous support of over 50 donors. On behalf of the entire VIDYA family, I extend my gratitude for the generous contributions our donors have made on this campaign towards VIDYA School. One of the messages, that was scribbled on my running attire by a class 11 student was “When the legs gets tired, run with the heart !! !” and that is exactly what I did… Thank you VIDYA students , you helped me achieve a seemingly impossible feat from my perspective ; Thank you once again. ← Our Students Need Sponsors!